We are booking hunts for 2018 and 2019, mid January through mid March. We can comfortably accomodate around 15 hunters per week. Texas nonresident hunting license is required and costs $48.00 for a five day license, good for hogs, javelina, coyotes and small game. Our hunts are 5 day hunts, $750.00. Groups or individuals are welcome. We are an archery only hunting camp. For the safety of all concerned long range high power rifles are not being permitted at this time on any Crane County ranch hunts. No trophy fees. 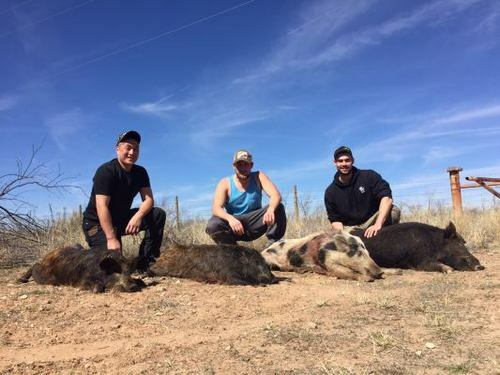 No limits on Hogs, Coyotes, rabbits and snakes. Limit one Javelina per hunt. We can pick you up and drop you off at the airport if you wish to fly in. Our headquarters building is about 45 miles from the Odessa-Midlands airport. If you want to fly in you can rent an economy car and it is only a short drive. You will need to have your own transportation to hunt the ranch. Good graveled roads are prevalent on most of the ranch to the oil rigs and water hole windmills which provides good access to hunting areas. A 4x4 is not needed for most of the ranch. We will help you retrieve your game if necessary. Grocery stores, restaurants, gas stations, and Walmart/Hardware stores are close by in Odessa and Crane Texas. You can get your hunting license at any Walmart store in Texas. We will have corn available for sale at the ranch. You need to bring a sleeping bag, clothes, towel, pillow, weapon, groceries and a cooler to take your meat home. We provide everything else. Call and reserve a spot for your group now.